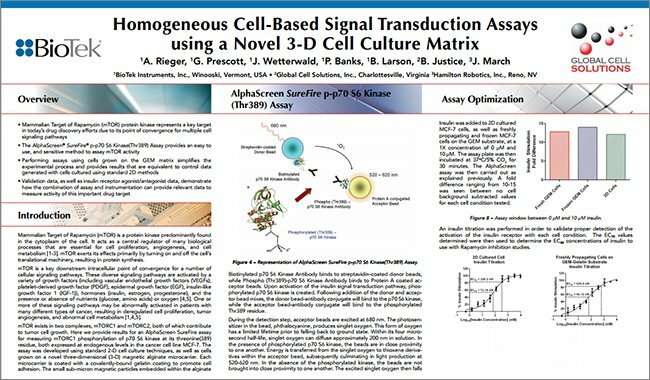 Transient transfection of tissue culture cells is a routine method to introduce novel genetic elements into cultured cells. While there are numerous methods to introduce foreign DNA into tissue culture cells the efficacy of the experimental results is dependent on adequate expression of the introduce gene. 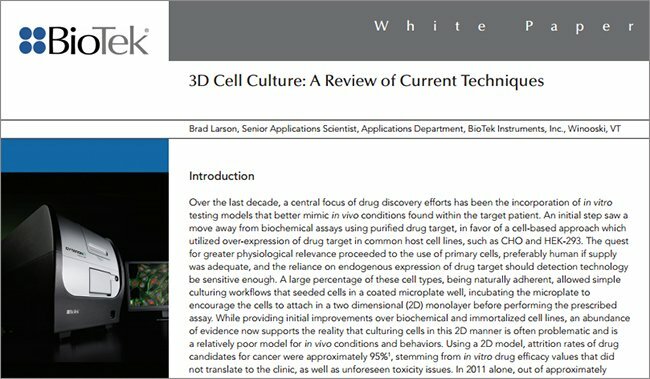 Here we describe the use of the Cytation™ 3 Cell Imaging Multi-Mode Reader to optimize and assess gene expression and transfection efficiency in live cells after transfection using a BacMam gene delivery system. It is almost 20 years since Roger Tsien’s pioneering work with green fluorescent protein (GFP) where he showed that the GFP chromophore is formed in a chemical reaction which requires oxygen but without the need for any protein co-factor. Over the years, Tsien and collaborators constructed various GFP mutants by mutagenesis that possessed greater fluorescence quantum yield and had different excitation and emission spectra, such that a rainbow of GFP-like proteins are now available. Furthermore, the relatively easy genetic encodability of GFP and its variants as a fusion protein allows them to be used to localize proteins as they move around the cell, as well as monitor protein translation. GFP and its many colored variants are now well established tools used in cell biology, particularly with imaging techniques. For his role in the development of GFP as a preeminent tool in the cell biologist’s toolbox, Tsien was awarded the Nobel Prize in Chemistry in 2008. 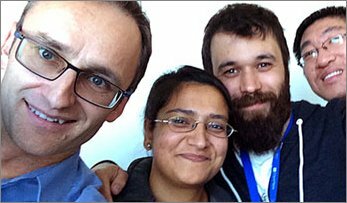 There are many ways that GFP fusion proteins can be generated in live cells. A particularly useful method for gene transfer into mamalian cells involves using baculovirus, an insect cell virus that can be modified to express proteins in mamalian cells. This is commonly called BacMam (Baculovirus – Mamalian cells) – see Figure 1. 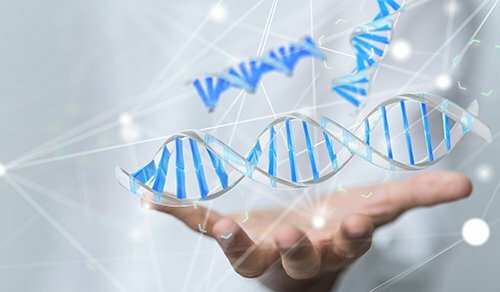 BacMam gene delivery technology is a transient expression system, which has many attributes that make it more attractive than stable expression. 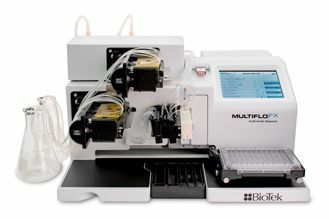 These attributes include rapid gene delivery, simple workflows that allow for the use of automation, relative non-toxicity compared to other methods, broadly applicable to many cell types including hard to transfect cells such as primary and stem cells and has the capacity for large foreign gene inserts up to 38 kb. 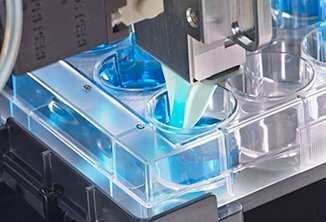 It has been used over diverse applications including the protein expression of biologics, high throughput screening and very commonly for fluorescence microscopy involving the transfer of GFP fusion proteins. 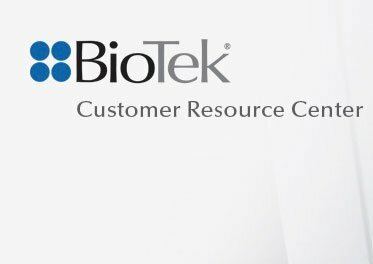 In this application note, we will demonstrate the utility of a novel cell imaging multi-mode reader for BacMam GFP fusion protein transfection assay development in microplates. 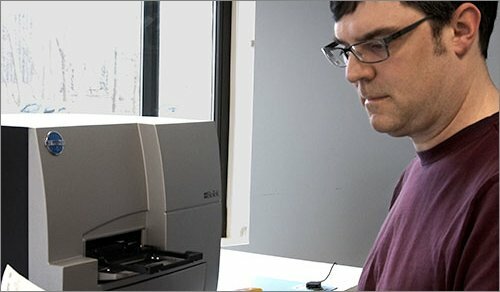 The reader performs PMT-based whole well epi fluorescence intensity measurements from the top of microplates; and CCD-based inverted digital microscopy from the bottom of microplates. Used together, the two detection modes facilitate the optimization of BacMam GFP fusion protein transfection conditions for fluorescence microscopy applications in microplates. U-2 OS cells (Sigma Aldrich) were grown in Advanced DMEM (cat # 12491) from Life Technologies supplemented with 10% FBS, 2 mM glutamine. Black sided, clear bottom 96-well (cat# 3603) microplates were from Corning. TopSeal-A (cat # 6050195) adhesive plate sealers were from PerkinElmer. BacMam Histone H3 reagent (Cat # A12894), and phenol red free DMEM/F12 media (cat # 11039021) were purchased from Life Technologies. U-2 OS cells were grown in Advanced DMEM supplemented with 10% FBS, 2mM glutamine, Penicillin/ streptomycin Cell cultures were maintained at 37°C, 5% CO2 in a humidified incubator. Cultures were routinely trypsinized (0.05% Trypsin-EDTA) at 80% confluency. 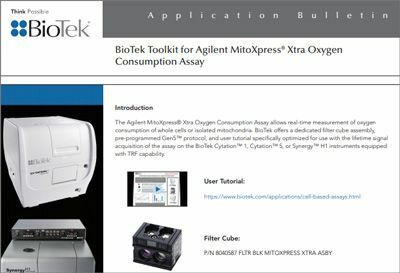 For experiments, cells were resuspended in phenol red free DMEM/F12 media supplemented with 10% FBS, 2 mM glutamine, and plated at 25,000 cells per well (75 μL) using the peripump dispenser of the MultiFlo™ Dispenser (BioTek Instruments). A series of 2x BacMam Histone H3 reagent solutions were prepared. BacMam virus reagent was serially diluted using phenol red free DMEM/F12 media, supplemented with 10% FBS, 2 mM glutamine. After serial dilution 75 μL aliquots of each dilution were added manually to 96-well plates containing previously plated U2OS cells in 75 μL. 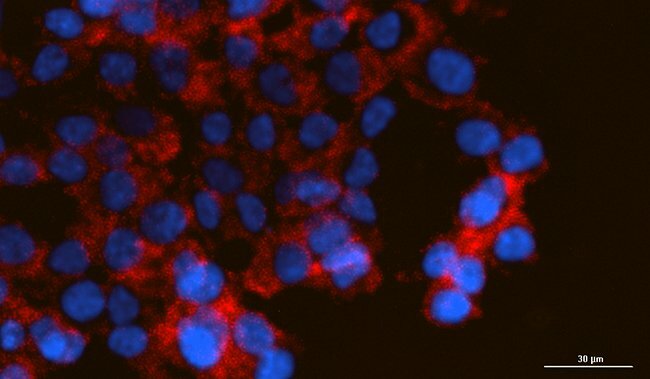 Cells nuclei were stained with Hoechst 33342 (bisBenzimide) solution (Sigma Aldrich cat.# 14533). A stock solution (35 mM) Hoechst 33342 solution in DMSO was diluted in phenol red free DMEM/F12 media to 10 μM to make 2x working solution immediately before use. 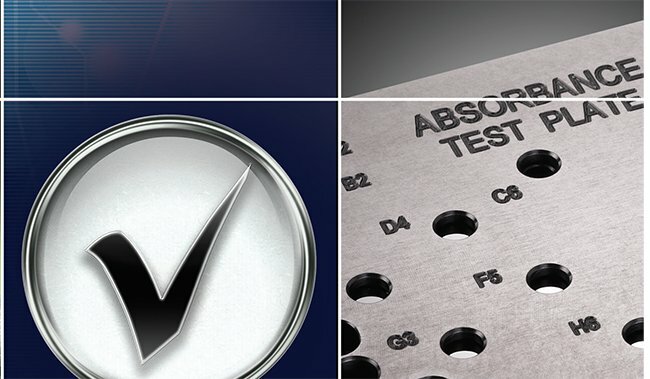 To each well of the microplate 150 μL of the working solution was added and the plate incubated at 37 °C 5% CO2 at a final concentration of 5 μM for 15 minutes. After staining plates were sealed using a clear adhesive sealer. 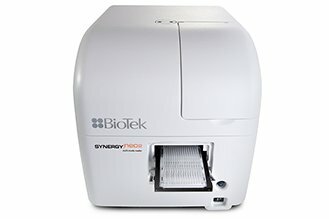 Cytation3 is a cell imaging multi-mode microplate reader. In this work, twin dual grating monochromators provided top-reading whole well fluorescence intensity measurements; automated CCD-based digital inverted fluorescence microscopy was performed from the bottom of microplates. Microscopy light cubes were configured for DAPI, GFP and Texas Red fluorescence. The DAPI light cube is configured with a 377/50 excitation filter and a 447/60 emission filter; the GFP light cube uses a 469/35 excitation filter and a 525/39 emission filter; while the Texas Red light cube uses a 586/15 excitation and 647/57 emission filters. Both 4x and 20x microscope objectives were used in imaging studies. Exposure settings were automatically determined for each color independently on a defined control well, while focus was provided automatically on each well using the DAPI signal. 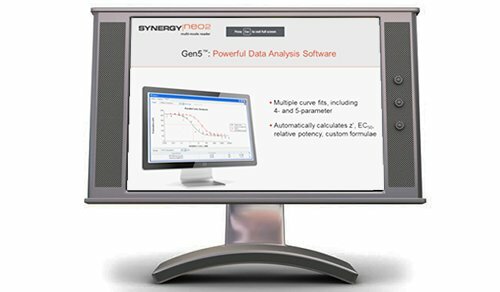 Reader was controlled and data captured and analyzed using Gen5™ Data Analysis Software. 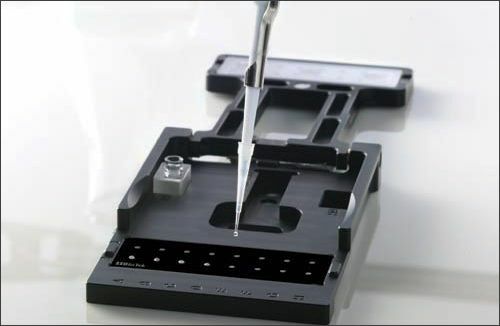 The time course of BacMam transfection was performed with the microplate remaining in the Cytation3. Atmospheric control over the microplate was maintained using the BioTek Gas Controller module such that CO2 levels were maintained at 5%. The reader also provided temperature control at 37 °C ±0.5 °C. U-2 OS cells infected with BacMam Histone H3 virus will express chimeric Histone H3-GFP fusion protein in their nuclei. The chimeric protein can then be monitored via fluorescence. Infected cultures were monitored kinetically over a period of 24 hours. As demonstrated in Figure 2, distinct cellular expression of GFP fluorescence can be observed as soon as 6 hours reaching a maximum at 16-20 hours and then beginning to subside at 24 hours. Figure 2. GFP Expression Time Course. A series of 4x images of U-2 OS cells infected with BacMam virus at a concentration of 7.5% (v/v). Upon infection, Histone H3-GFP fusion protein is expressed in the nucleus. Images were taken every 2 hours over a 24-hour time period after viral exposure to the cells. Scale bar indicates 400 μm. One interesting observation was the considerable GFP fluorescence present in the virus solution immediately with infection. This is evident in Figure 3, which shows that the fluorescence of U-2 OS cells immediately after infection with BacMam virus is proportional to viral load. The timing of the measurement suggests that this fluorescence is not the result of U-2 OS Histone- GFP cellular translation, but rather background fluorescence from the BacMam virus system. Only after infection and gene expression and protein translation is new Histone H3 GFP fusion protein detected. Figure 3. Initial Fluorescence of BacMam Histone H3 Treated Cultures. The Top-Read green fluorescence (Ex 485 nM, Em 528 nM) of cultures infected with various concentrations of BacMam Histone H3 was measured immediately after infection. Data represent s the mean of eight determinations at each virus concentration. This supposition is corroborated in Figure 2 where an obvious high background is seen at earlier time points. As the transfection progresses, the fluorescence is concentrated within the cells at their nucleus and the background drops. This is confirmed in Figure 4 which demonstrates how the minimum pixel intensity in the images drops over time. This indicates that the virus has inherent GFP-associated fluorescence which is transferred to the cells and their nuclei. Figure 4. Minimum Pixel Value over Time. The minimum pixel value was determined in the 4x images displayed in Figure 2. While the BacMam system is reported as being non-toxic to mamalian cells, the fold-increase in fluorescence is effected by viral concentration at the time of infection. Figure 5A demonstrates the fold change in GFP fluorescence of several different viral concentrations over a period of 16 hours; where after a lag phase of approximately 4 hours all viral concentrations demonstrated a steady increase. Interestingly the highest virus concentration (50%) demonstrated markedly less off an increase than many of the other lower virus concen-trations tested. In fact the 50% virus concentration was no better than the increase observed with virus concentrations 30-fold less. When fold change values are compared using an end point measurement at 16-hours, a virus concentration of 12.5% is shown to be optimal (Figure 5B). The failure of high viral loads to return increases in GFP expression suggests that extreme amounts of virus or over-expression of Histone H3-GFP fusion protein is somewhat toxic to the cells. Figure 5. Fold change in Top Read Fluorescence. 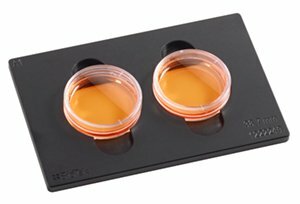 Hoechst 33342 dye effectively stains the nuclei of live cells and can be used to count the total number of cells present within the image. Images of U-2 OS cells infected with various BacMam concentrations indicate a decreasing percentage of cells are expressing green nuclear Histone H3 GFP with decreasing viral concentration (Figure 6). Figure 6. Live cell imaging with BacMam Histone H3 virus infected cells. U-2 OS cells were infected with different concentrations of BacMam Histone H3 virus (Numbers reported in the bottom left-hand corner of each image are % (v/v)). After 24 hour incubation cells were stained with 5μg/mL Hoechst 33342 for 15 min @ 37 °C cells were imaged with the 20x objective using the blue and green LED cubes. Scale bar indicates 80 μm. Wells with high viral concentrations also appear to have a lower number of total cells. This is corroborated with blue object counting of either 4x or 20x images, which indicate a 50-60% loss in total cell number 24 hours after infection (Figure 7). Figure 7. Imaged Cell Count with BacMam Infection. Blue signal images of both 4x and 20x were object counted using an intensity threshold of 10,000 and a minimum object size of 10 μm. All other analysis parameters were set to default. 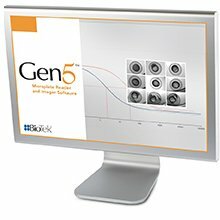 While object or cell counting has been described previously in regards to a single color, Gen5™ Data Analysis Software is capable of object counting using data input from more than one color, allowing differential or ratiometric analysis of images. 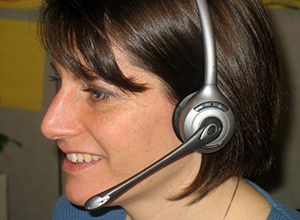 As demonstrated in Figure 8, in over-layed images three cells have been identified using the blue signal channel, while only one cell has been identified using the green channel. In both cases, identification is signified by Gen5 with gold tracing around the identified object. In this experiment, Hoechst 33342 staining will identify all cell nuclei, while the green signal is dependent on Histone H3 GFP fusion protein expression by the BacMam gene delivery system. Histone H3-GFP transfection efficiency, expressed as a green/blue ratio can be determined by object counting both the blue signal (Hoechst 33342-stained nuclei representing all cells) and the green signal (Histone H3- GFP transfected cells) . The analysis of either 4x or a 20x images show a sigmoidal increase in the green to blue object count ratio as a function of virus concentration (Figure 9). 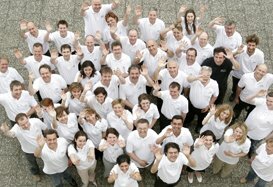 Maximal transfection efficiency using the BacMam system is approximately 85%. While the observed ratio using 4x images was greater than that of the 20x image at the highest virus concentrations, both data sets demonstrated that maximal efficiency was achieved at less than the maximum amount of virus. 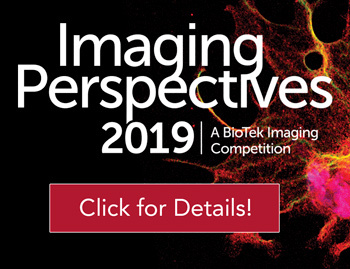 The 4x images are the preferred choice of objective for the assessment of transfection efficiency as the number of cells sampled will be greater than 20x imaging. Figure 9. Figure 8. Blue-Green Cell Counting. Image depicting 3 cells in either blue (Hoechst 33342) or green (GFP) channels. Object counting “cell nuclei” using blue or green signal with an intensity threshold of 10,000 and a minimum object size of 10 μm, all other analysis parameters set to default. Counted nuclei have a gold perimeter associated with them, drawn by Gen5. Scale bar indicates 20 μm. Histone H3-GFP transfection efficiency, expressed as a green/blue ratio can be determined by object counting both the blue signal (Hoechst 33342-stained nuclei representing all cells) and the green signal (Histone H3- GFP transfected cells) . The analysis of either 4x or a 20x images show a sigmoidal increase in the green to blue object count ratio as a function of virus concentration (Figure 9). 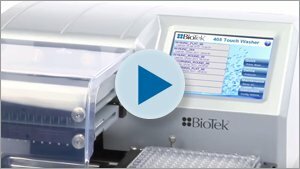 Maximal transfection efficiency using the BacMam system is approximately 85%. While the observed ratio using 4x images was greater than that of the 20x image at the highest virus concentrations, both data sets demonstrated that maximal efficiency was achieved at less than the maximum amount of virus. 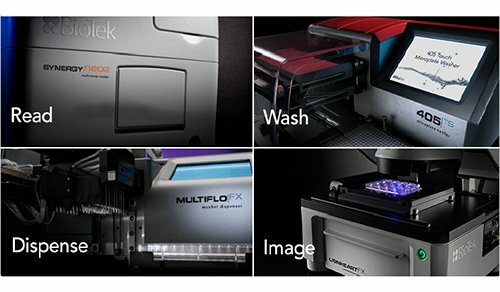 The 4x images are the preferred choice of objective for the assessment of transfection efficiency as the number of cells sampled will be greater than 20x imaging. Figure 9. 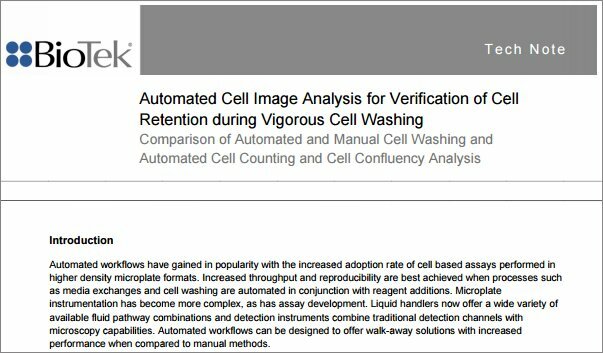 Effect of Virus concentration on Transfection Efficiency. Using a signal threshold of 10,000 and a minimum size of 10 μm (all other analysis parameters at default), object counting for nuclei identified total cell number in blue (Hoechst 33342) and transfected cells in green (GFP) channels, respectively. The ratio of cells positive for Histone H3-GFP transfection can then be assessed and plotted against virus concentration for both 4x and 20x images. 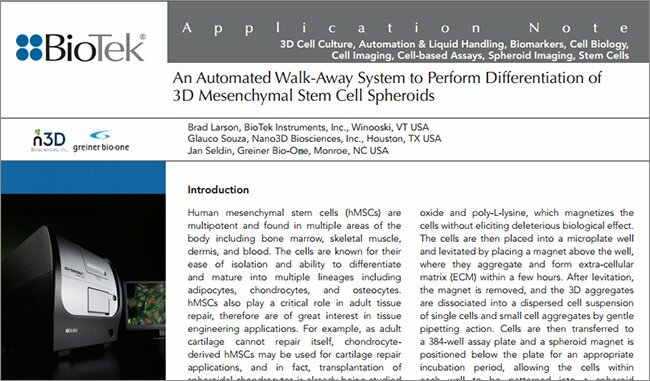 These data demonstrate the ability of the Cytation™3 Cell Imaging Multi-Mode Reader to perform live cell imaging and optimize conditions for transient transfection of cells using the BacMam gene delivery system. Time course experiments over a period of 24 hours demonstrate the temporal transient increase in GFP fluorescence of U-2 OS cells when transfected with the BacMam system. Kinetic traditional top-read epi fluorescence was then used to corroborate the image data. Live cell two-color imaging allowed for object counting to identify positive transfectants, as well total cell number. 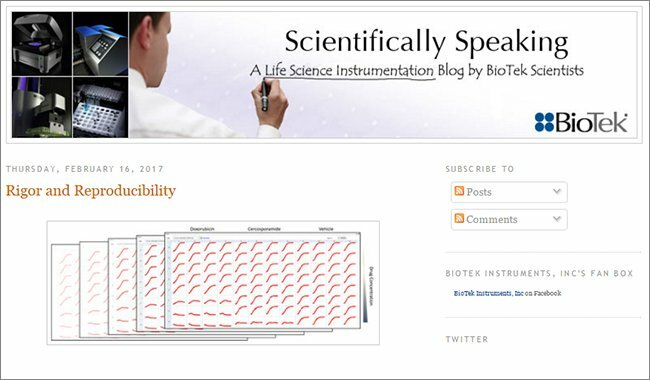 This two-color analysis was then utilized to calculate transfection efficiency as a function of virus concentration. Viral toxicity was also identified using object cell counting. 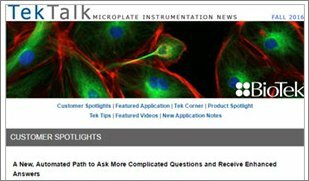 Live cell imaging offers some advantages over fixed and stained cell imaging. Foremost is the fact that live-cell imaging can provide data regarding cellular processes in real-time. 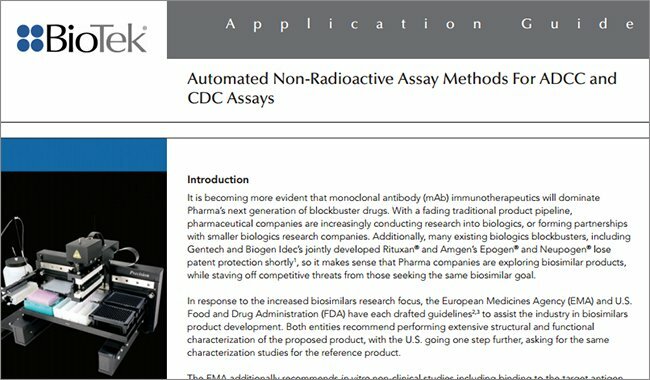 While fixed and stained cells can be probed with an almost limitless number of antibodies, this technique is static and offers only a snapshot in time as to what is occurring. 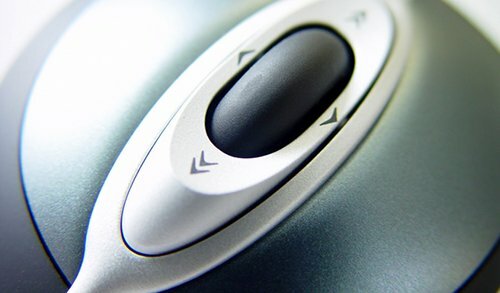 Kinetic measurements of live cells can also provide tracking and translocation information. The BacMam delivery system provides a number of different fusion protein options to allow the investigation of mamalian cellular organelles, cellular structures and processes. 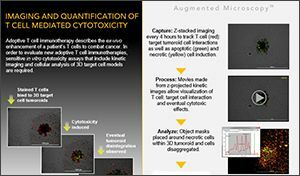 Cytation3 is an ideal platform for live cell imaging. 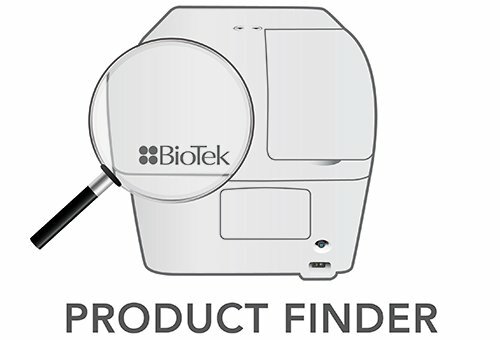 As with other BioTek Multi-Mode Readers, the Cytation3 offers a full complement of top-read microplate reader capabilities including dual monochromator and filter based fluorescence detection. The reader can be configured with the BioTek Gas Controller module, which allows for control of carbon dioxide and oxygen levels in the read chamber. 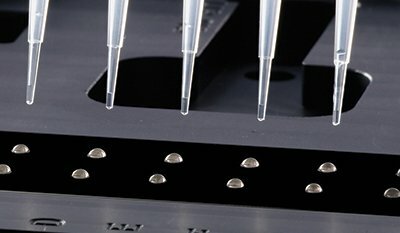 This allows the researcher to run unattended long term kinetic measurements on microplates without the worry in regards to maintaining media pH. Likewise, experiments requiring hypoxic conditions can be performed using the Gas Control module to purge oxygen from the read chamber and replace it with inert nitrogen. 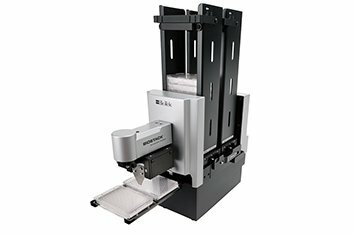 In addition, the reader can be configured with dual injectors, which allow for the addition of cellular dyes in mid run, shortly before imaging; thus reducing exposure time to the dye, while still providing the ability to run long-term experiments unattended.